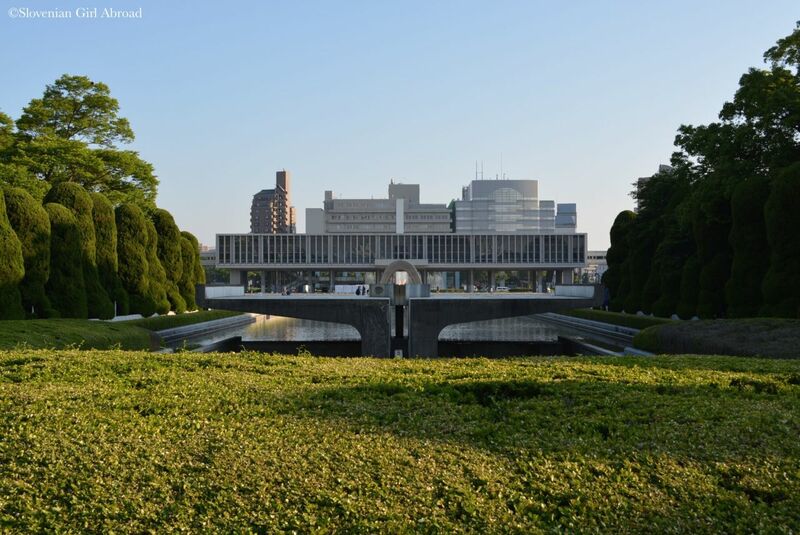 The Peace Memorial Museum is a museum dedicated to the WW2 atomic bombing of Hiroshima. After paying the symbolic admission fee of 50 JPY per person, we’ve entered the exhibition area. 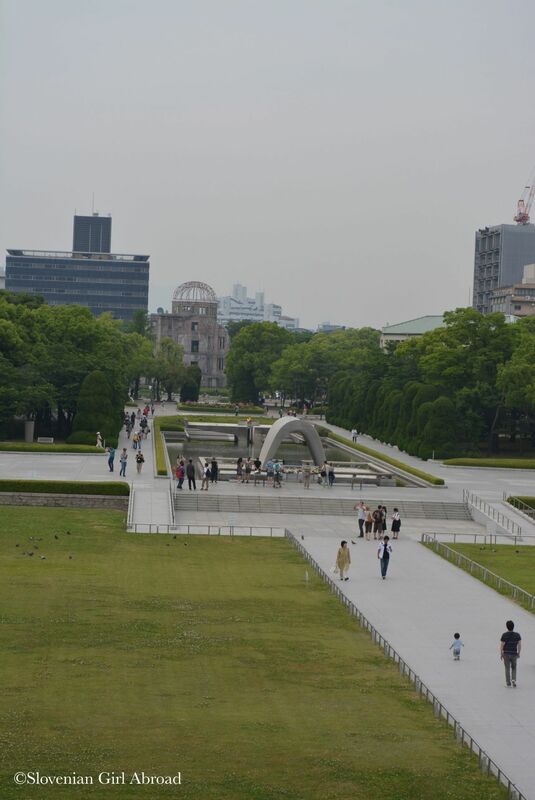 The exhibition narrates the story of the 6th August 1945, the day of the first-ever atomic bombing. It focuses on the human side do the story explaining the devastating force of the bomb, the impact of the bomb and what happened in the aftermath. It shows all the horrors and devastating effects atomic bomb had. Although some of the presentation methods are a bit outdated, museum still manages to narrate the story of the bombing efficiently. It is deeply emotional and educative experience. 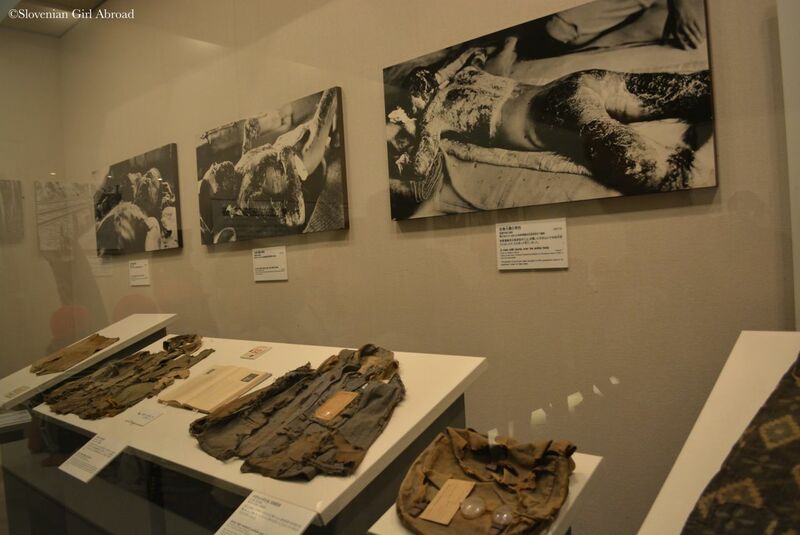 Exhibits showing the horrors of the explosion: photos of burned human bodies and clothes they were wearing during the explosion. The message of the museum is clear. The war is devastating. It is up to us for never let something so horrible like atomic bomb explosion to happen again. The peace is what we all should aim to. 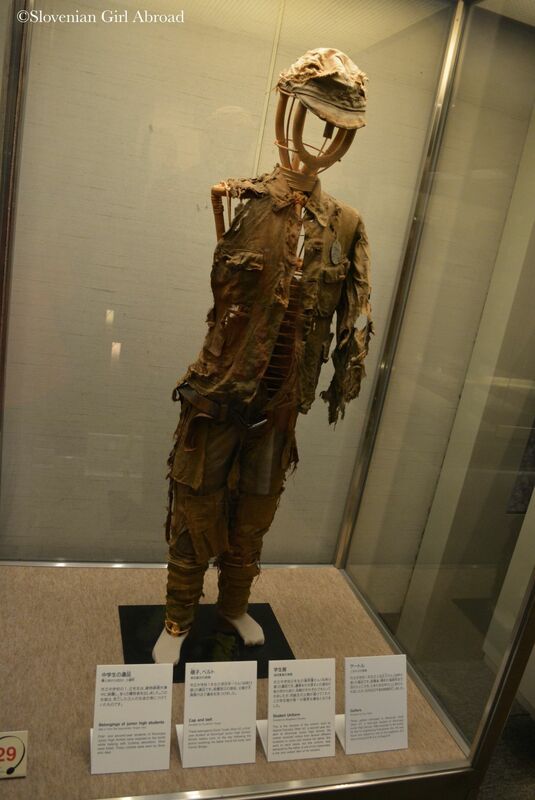 Clothes worn by three children who died in the A-bomb explosion. 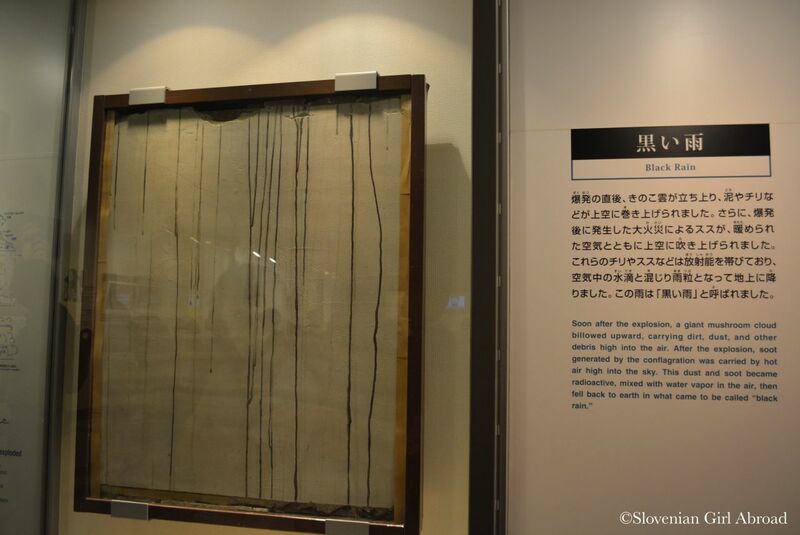 What I’ve missed in this exhibition is a bit of the background why did Allied forces decided to throw atomic bomb to Japan – to Hiroshima particularly. What have Japanese done during the WW2 to deserve such a harsh punishment. They did some really bad things, but the museum doesn’t tell anything about it. The reason is apparently, the museum is currently undergoing major renovations and only one of two museum buildings are open for public. According to my friend who had visited museum prior to the renovation, the part where they’ve explained the background of the war is currently under construction. After the A-Bomb explosion, a thick high radioactive rain started falling in a wide Hiroshima area. After we’ve saw the exhibition, we went to see the National Peace Memorial Hall, another monument/museum commemorating the victims of the bombing and expressing the desire for genuine and lasting peace. 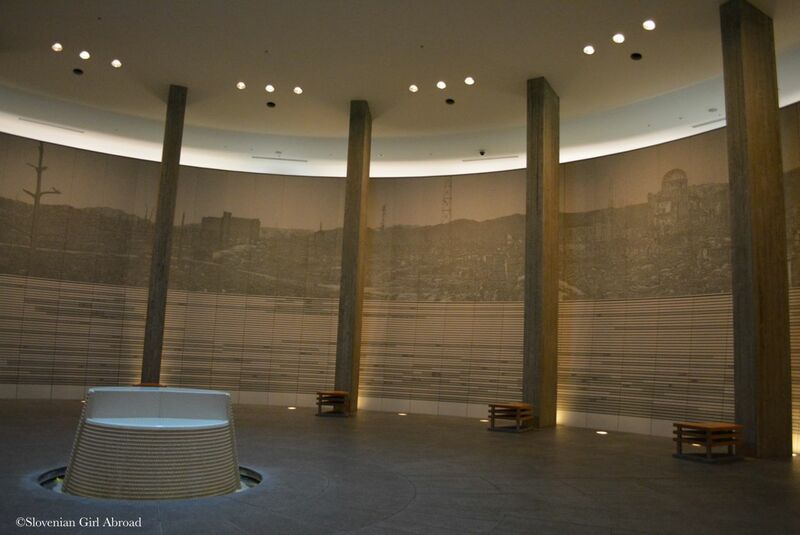 The museum contains the Hall of Remembrance – a 360 degree panorama of destroyed Hiroshima recreated by using the same amount of tiles as the estimated number of the victims of the bombing – 140.000 tiles. At the top of the National Peace Memorial Hall building, you may see the clock, frozen at 8:15 – the time the bomb went off. 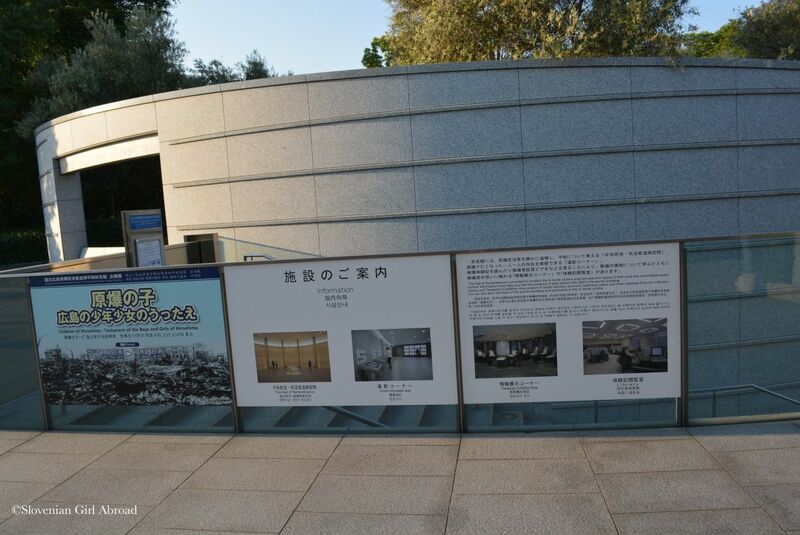 The Memorial Hall also contains seminar room, temporary exhibition, and victim’s information area. At the time of our visit, there was an video exhibition showing short-films narrating the memories of the children who survived the explosion. They were narrated in Japanese, but had English subtitles. We watched few heartbreaking stories, before we’ve moved to the library. After spending hours learning about Hiroshima’s dark history, it was time for brighter experience: exploring Hiroshima’s cuisine. 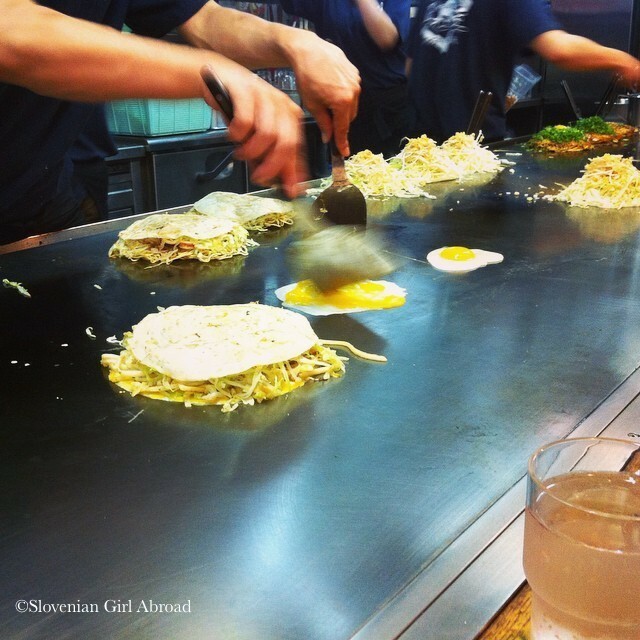 We want to try some Hiroshima style okonomiyaki. We found a restaurant Nagataya that served wished dish. Because there was a queue in front of the restaurant, we thought it is a good sign. We gave it a try. A short wait was worth it. Our okonomiyakis were delicious. With our bellies full, we took bus, train and ferry to Itsukushima island better known as Miyajima. The island has a long history as a holy site of Shinto. Today Miyajima is most famous for its giant torii gate, which at high tide seems to float on the water. In less than an hour, we arrived to the island. Unfortunately, it started raining on our way there and it didn’t stop the whole time while we were there. The rain didn’t stop us. We bought two umbrellas and walk around. 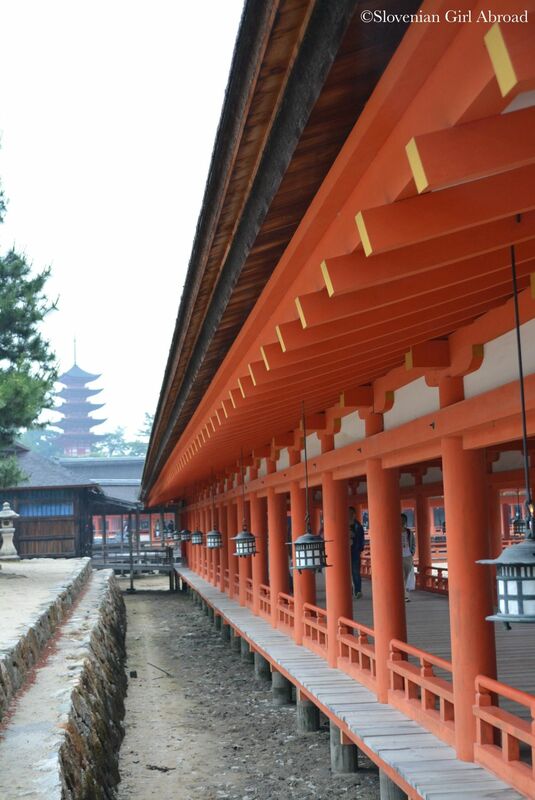 We’ve visited the Itsukushima Shrine (Itsukushima Jinja), a shrine complex built in the end of the 6th century. It consists of multiple buildings connected by boardwalks and supported by the pillars. 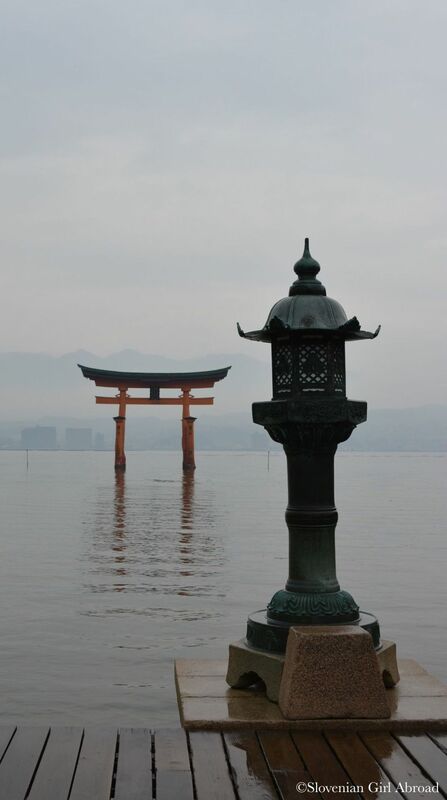 Likewise the torii gate, the shrine seems to float on the water at the high tide. At the time of our visit, the tide was high enough to see torii gate floating on the water, but wasn’t high enough to see the shrine floating. 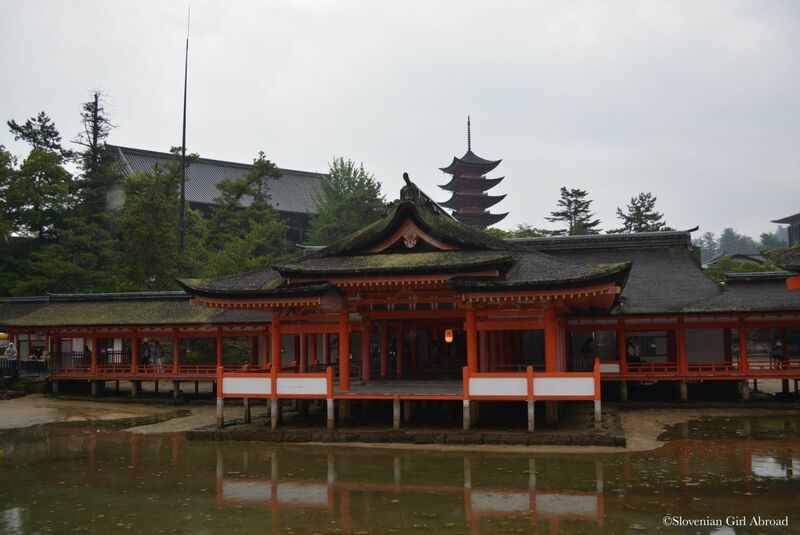 UNESCO recognised Itsukushima Shrine’s outstanding universal value and inscribed it to its World Heritage list in 1996. 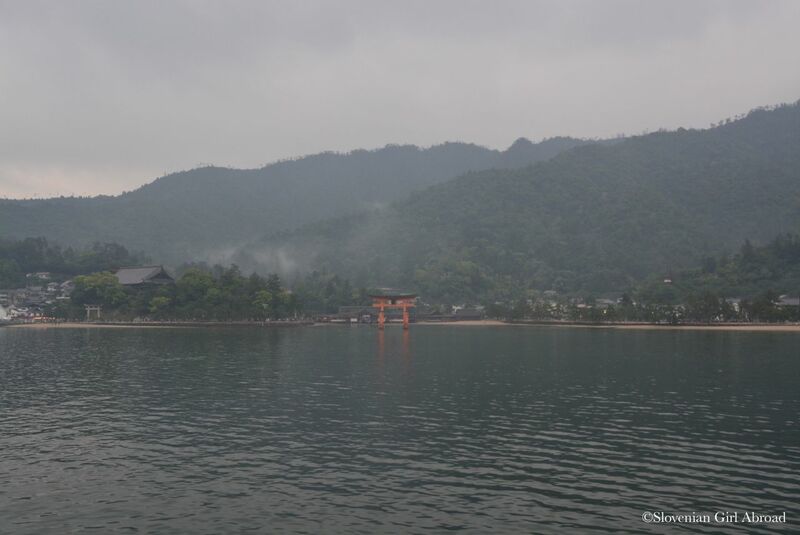 Despite the bad weather, I was impressed by the Miyajima island. 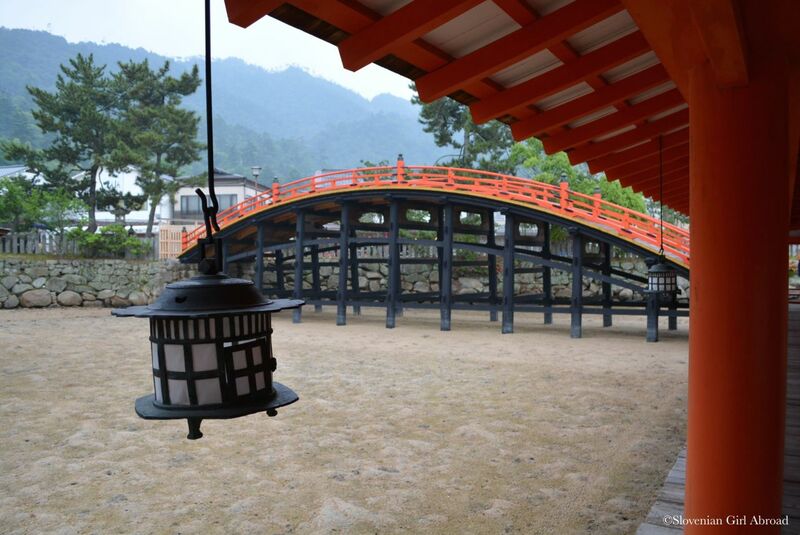 The scenery, the harmoniously arranged architecture and the impressive torii gate are smply amazing. I definitely understand why this place is iconic. It is indeed something special. After spending some time exploring island in the rain, it was time to leave. We’ve returned back to Hiroshima. We’ve grabbed some food at the convenience store and returned to our hotel to recharge our batteries for the next day. That must be such a poignant place to visit. 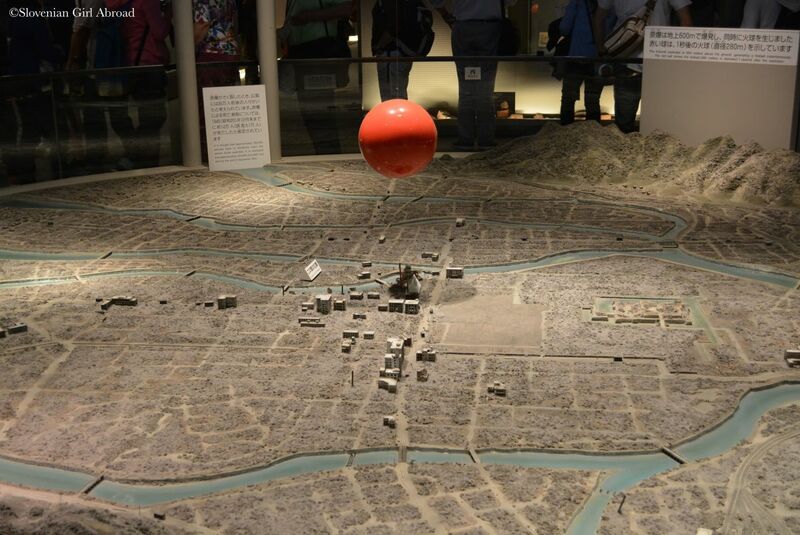 Congratulations for sharing this story of Hiroshima, which is something we should remember. Although the Peace Park is an emotional experience, it is also uplifting to see how the Japanese people have taken a tragedy and used it to spread a song message for peace. On a lighter note, I’m glad you also experienced okonomiyaki – definitely part of the Hiroshima experience. Thank you John! I agree. I think the WW2 changed Japanese people as a nation. I’m sure the tragedy of Hiroshima and Nagasaki played a significant role in that change. Their history prior to the WW2 suggests they were fierce, not willing to bend easily. After the war, they seem to take the tragic events to transform themselves into peaceful nation. I admire them how well they handled the guilt for the crimes committed during the WW2 and the Hiroshima & Nagasaki tragedies. I wish more nations would be like them – that they would strive towards the peace in the world. I exactly did your same trip (Miyagima and Hiroshima) last summer, when we visited my parents in law. Very impressive (Hiroshima, the atomic bomb museum), very nice (the okonomiyaki, even if I prefer the Osaka style) and very beautiful (Miyagima island). All the best for your nice blog! Three of our sons have been here on school exchanges from Australia. 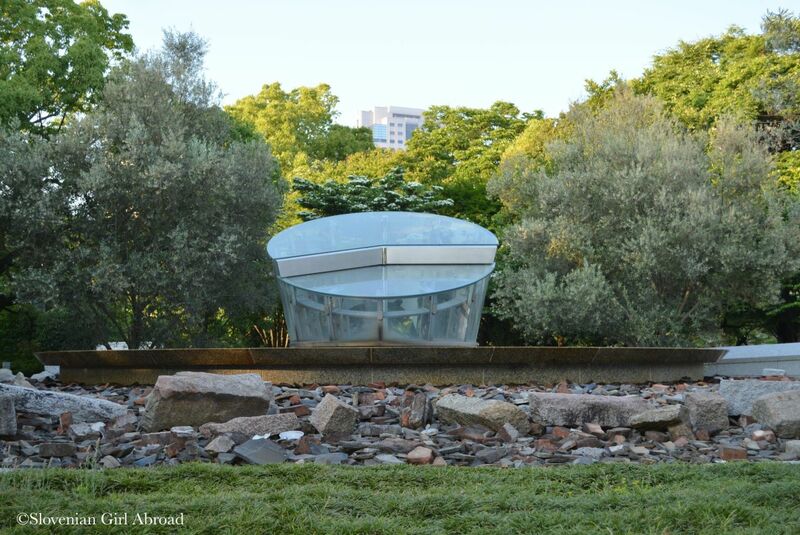 The Peace Park was a place that had a big impact on them. 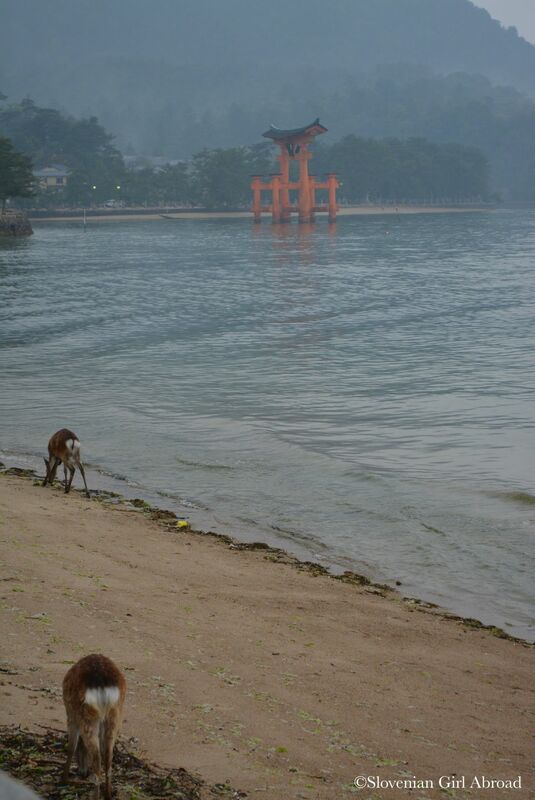 They enjoyed Miyajima as you did. We hope to travel to Japan next year and these are two places we plan to visit. Thanks for sharing. great memories. I adored both places! Thanks for sharing!